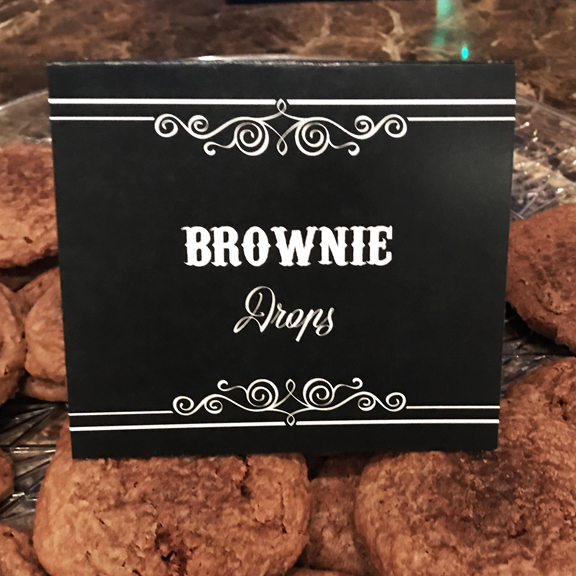 This entry was posted on August 30, 2018 by thatpartychick. 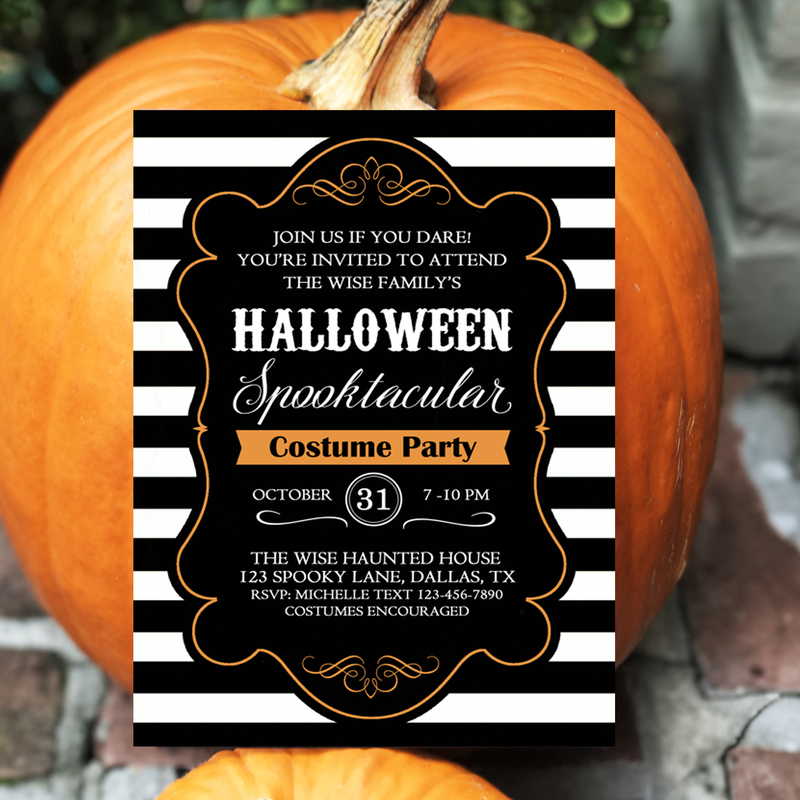 Eye of newt and whisker of cat, leg of spider, and wing of bat! 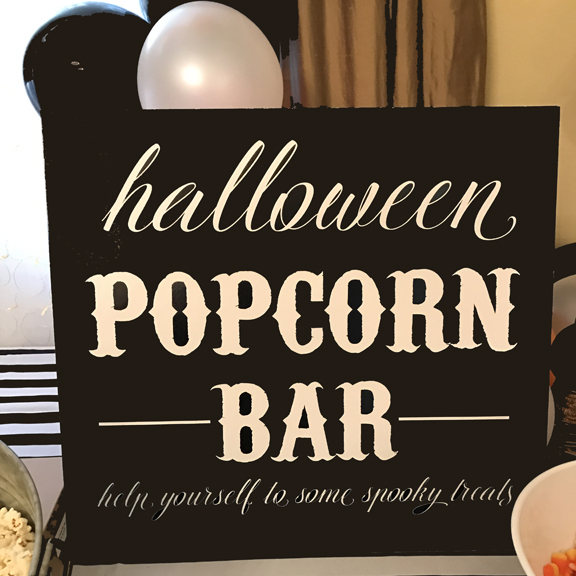 The witches’ brew is almost done, It’s Halloween, let’s have some fun! 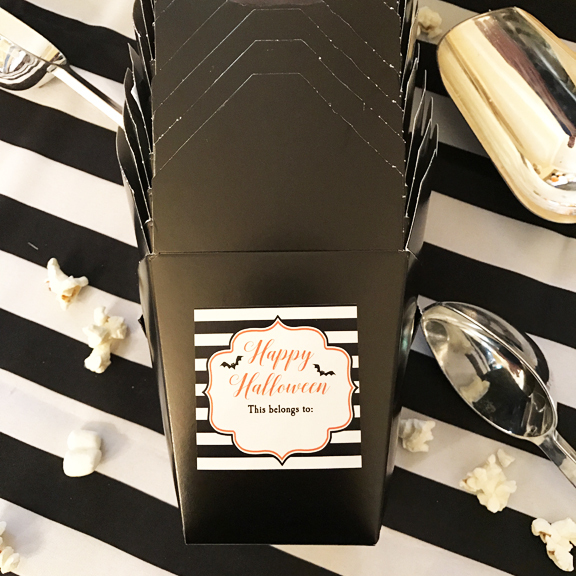 Kids were excited from the start with this invitation from Katherine and Caroline. 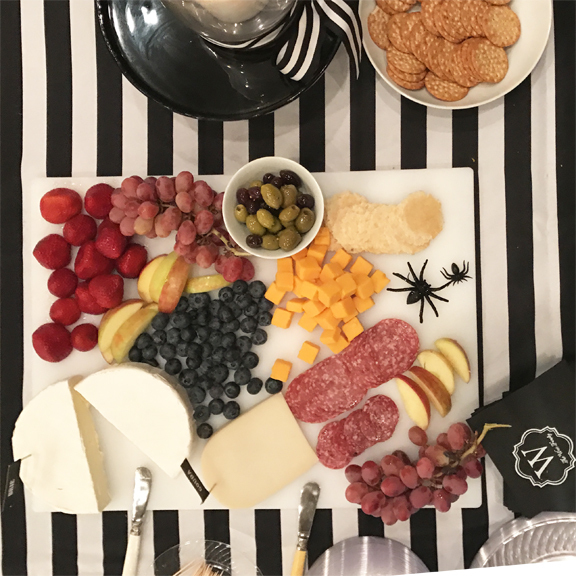 Black and white decorative mesh, ribbons, and twinkling lights gave a warm welcome to costumed party goers. 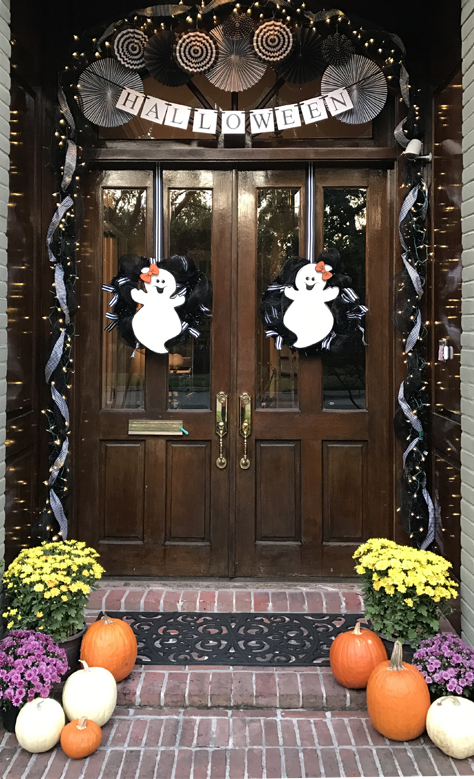 Black and white pin wheels and ghosts were intertwined in the door decorations and a “Halloween” banner completed the entrance! 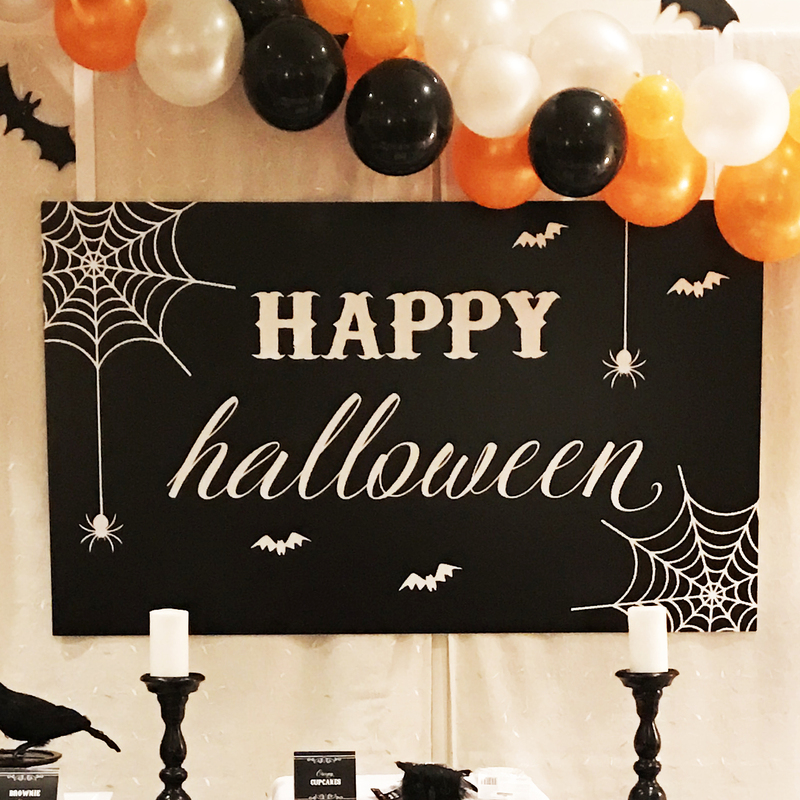 A black and white backdrop saying "HAPPY Halloween" with spiders and spiderwebs hung over the refreshments table. 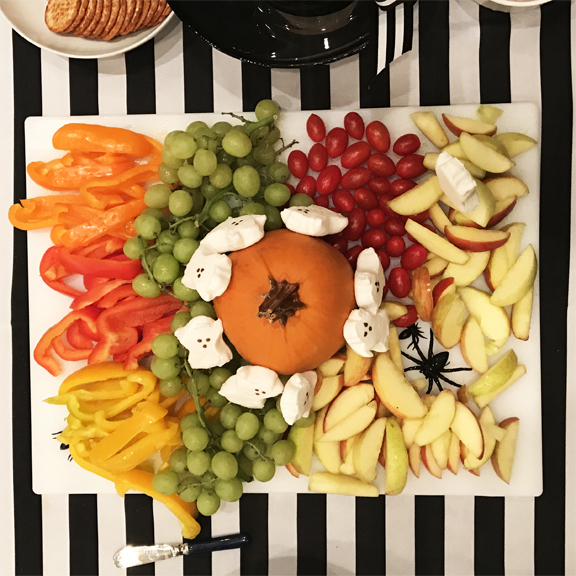 Refreshments included a fruit and vegetable plate with ghost marshmallows and a cheese plate. 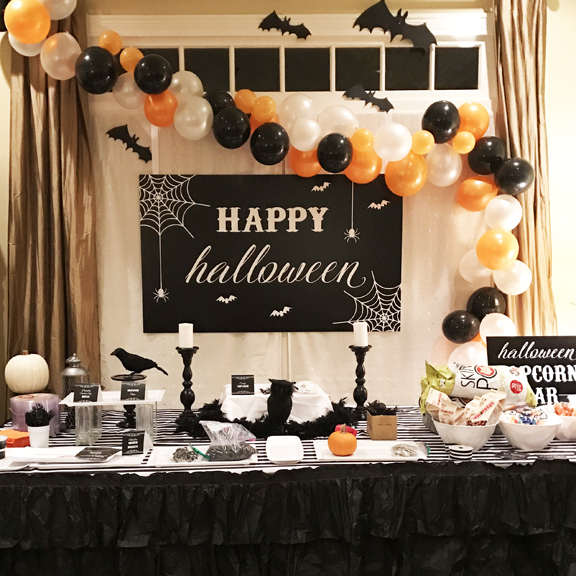 The refreshments table also included a popcorn bar where the kids could fill up their own popcorn boxes with an assortment of popcorn and treats. 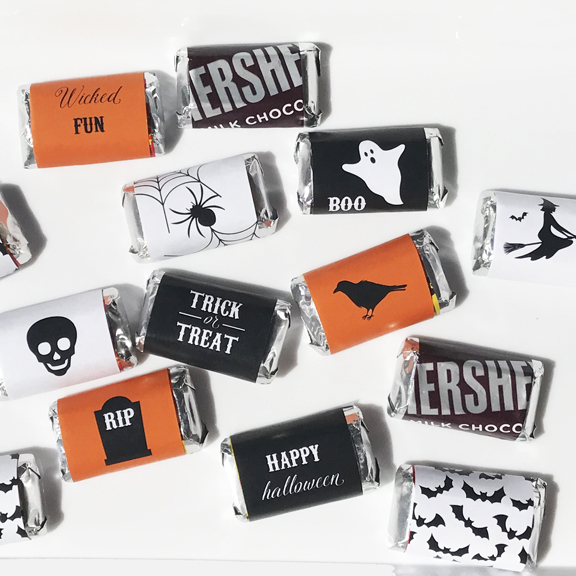 Miniature chocolates were wrapped in black and white and orange party papers! 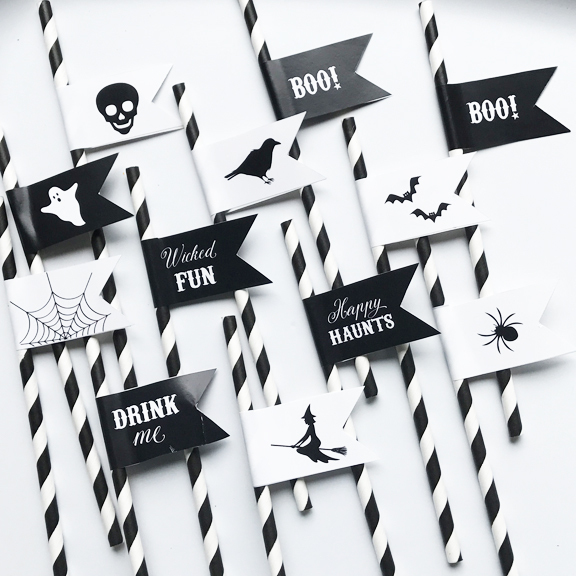 There were witches, spiders, skulls, gravestones, ravens, bats, and ghost images to choose from! 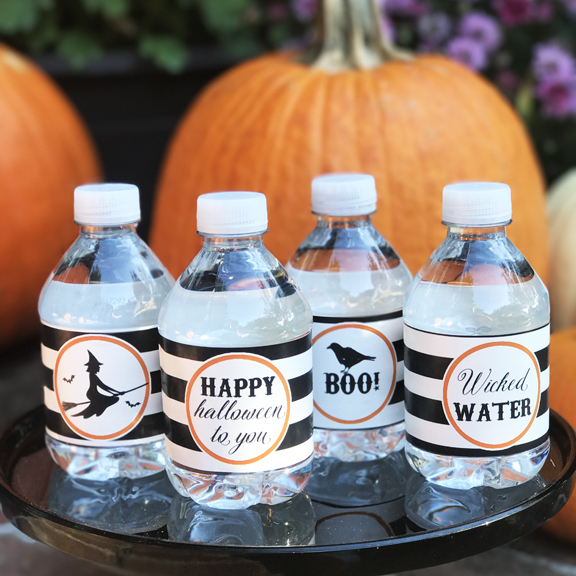 Wicked Water was available for the thirsty ghosts, goblins, and witches in attendance. 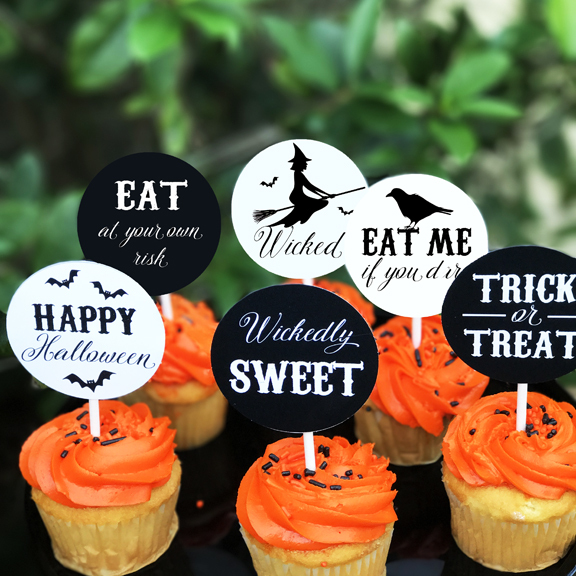 Spooky images and sayings of witches, crows, "HAPPY halloween to you", and "Wicked WATER" popped against the black and white stripe background. 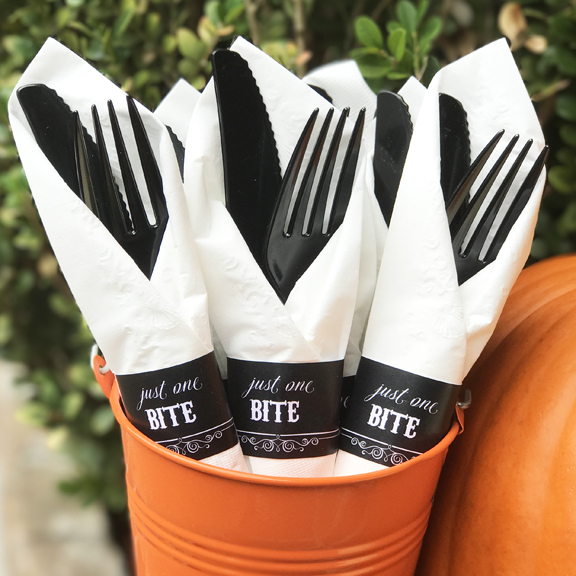 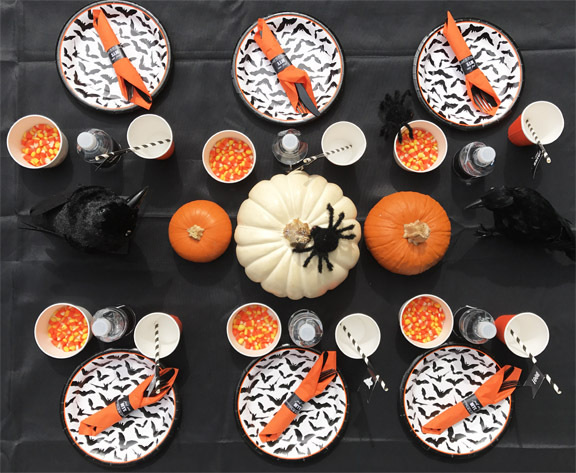 The table was set with black and white bat plates with an orange rim, orange napkins with personalized black and white napkin rings reading "just one BITE", orange cups with black and white stripe straws with scary fun straw flags, and cups of candy corn. 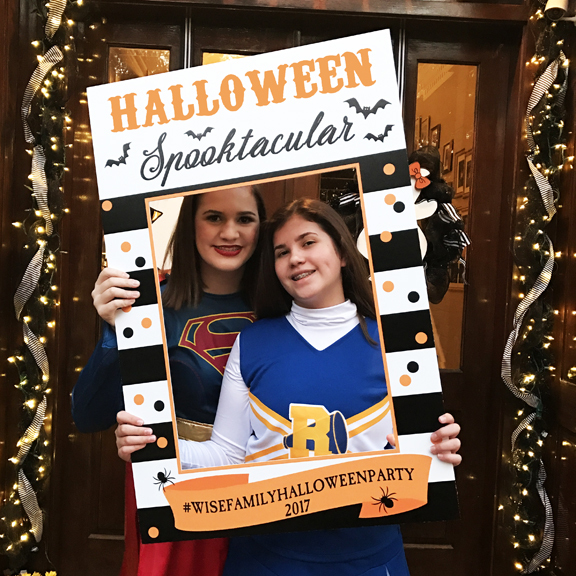 The kids had fun in Halloween Spooktacular photo booth!